This is the second album by the German octet Peuker8Find albums by this artist, led by guitarist / composer Paul PeukerFind albums by this artist, which also includes pianist Clemens Christian PotzschFind albums by this artist, saxophonist Mark WeschenfelderFind albums by this artist, violin quinton (five strings violin) player Alina GropperFind albums by this artist, viola quinton (five strings viola) player Filip SommerFind albums by this artist, cellist Elizabeth CoudouxFind albums by this artist, bassist Eugen RolnikFind albums by this artist and drummer Florian LauerFind albums by this artist. Vocalist Sissi RadaFind albums by this artist guests on one track. 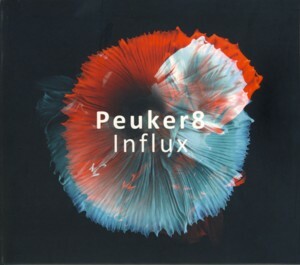 The album presents ten original compositions, all by Peuker. The music immediately strikes the listener with its originality and immense intensity, which are entirely unprecedented. It is a variety of Jazz-Classical Fusion, but no other music of that category has previously reached such level of natural symbiosis as this music, which amalgamates Jazz tradition with contemporary European chamber music, expanding the idiom´s boundaries tremendously. In fact the octet sounds like modern version of a chamber orchestra, where the string section, the rhythm section and the Jazz instruments take the roles of the traditional classical instrument, but the concept of creating music together as an ensemble stays basically the same, with a modernized sound and possibilities of course. The music, although obviously composed, allows huge amount of individual improvisational freedom, which adds spice and pizzazz to the proceedings and allows the musicians to create some superb solo contributions throughout the album. Although noticeably complex and multilayered, the music sounds coherent and focused at all times, and should be accessible to a relatively wide listening audience, in spite of its potent contents. It will take a while for this music to reverberate and achieve the recognition it truly deserves, but it definitely marks a milestone in European contemporary music, including the Jazz idiom but also way beyond. The aesthetic and intellectual ingenuity, talent and effort this album offers to the listener are all extraordinary and deserve the highest praise, which will be hopefully followed by acknowledgment as well. Hats off to Peuker and his cohorts for creating this music and to Roland SchulzFind albums by this artist, the head of the WhyPlayJazzFind albums on this label record label, for releasing it against all odds!